Powerful new technology removes greasy dirt from carpets and eliminates the rapid resoiling so common with conventional products. 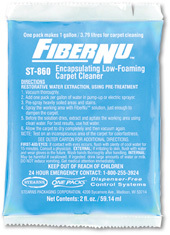 FiberNu’s reduced moisture, brittle dry-down, and encapsulating action trap dirt and expedite drying time. Carpeted areas can now be cleaned with minimal inconvenience for occupants. FiberNu’s anti-redeposition feature keeps carpets looking fresh longer. #860 - 72 x 2 fl. oz. per case. One pack makes 1 gallon. #861 - 36 x 4 fl. oz. per case. One pack makes 2 gallons. 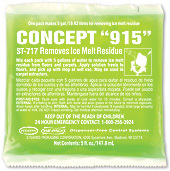 Removes the white crust of ice melting compound residue. Powerful chelating agents chemically suspend the salt and chloride residues in the mop solution or carpet extractor recovery tank. Leaves floors sparkling clean. Great for carpets too. Pleasant sassafras fragrance. #717- 36 x 5 fl. oz. per case. One pack makes 5 gallons.